Now and again, a trailer comes along for a movie which looks like it should be fun, but seems nonetheless achingly self-aware, a little too knowing. There appear to be too many central characters, all dialled up to 11 and trying to upstage one another. A script which seems to comprise lines designed for quoting and repetition out of context. A jukebox soundtrack of retro tunes compiled by someone who thinks they're hip but only listens to Radio 2 (and uses words like 'hip'). And you remember the glut of substandard, straight-to-video fare in the mid-1990s which followed Tarantino's breakout, where form was valued over function and the guy who made the tea on the set of Pulp Fiction would be hired to make the tea on the set of whatever-new-heist-movie so that the poster could claim some causal link to greatness. And you decide you'll probably watch it anyway, but with guarded reservations. Anyway, I needn't have worried (and nor need you). 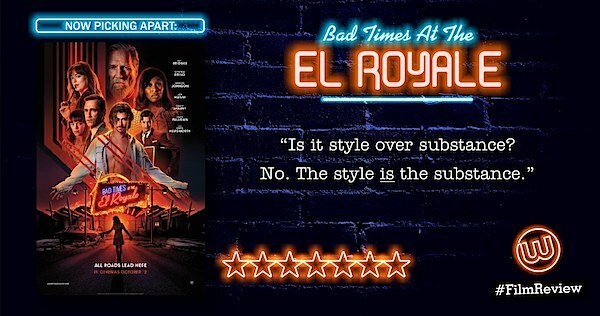 Bad Times At The El Royale is glorious. My word. From its opening scene, the audience knows this is going to be a meticulously paced stay. We begin with a solitary locked-off shot of the interior of a motel room. A nameless man enters alone, hides the film's macguffin and awaits his contact, all without a single word of dialogue. It feels like we're watching a stage play, an aesthetic that continues after the lone title-card, and characters arrive at the eponymous venue, checking in by systematically signing their names in the register. Rhythm and ritual reverberate heavily throughout Goddard's screenplay, from the the strained courtesy of receptionist Miles delivering the faded hotel's check-in welcome speech, to the methodical process of residents tearing through their rented rooms. The influence of that filmmaker mentioned above is felt particularly strongly, especially as it's the beats between the players' words which convey the meaning and betray their true intentions. But on a dark and stormy night with a guest-list full of secrets, there's as much Agatha Christie in here as there is Quentin Tarantino. The narrative deepens in the second act where we begin to see key events replayed from the perspective of different characters and learn more of their backstories. There are no wry, second-guess-baiting reveals at The El Royale, but the story uncovers its developments slowly and purposefully, waiting for the right moment of theatrical effect. And true to its stage ambience, this film is carried by standout performances from John Hamm, Lewis Pullman and above all Cynthia Erivo (and director Drew Goddard is certainly getting his money's worth from that actress's outstanding ability as a singer). Even Jeff Bridges forgoes his usual affable mumbling to bring a turn which is as touching as it is terrifying. Although it features a relatively small central cast, there's not a single dud (or even ordinary) performance in the whole film*2. As Goddard works with cinematographer Seamus McGarvey, the shots in El Royale are works of art in themselves, a counterbalance and symmetry running through the film like the state-line bisects the premises. Characters' hidden sides are revealed and then flipped back again, as we slowly learn that both of these facets make up who they really are. And we don't have to like who they may turn out to be, so long as we accept it. You are your inner-self and your outside-persona; no-one knows the face in your mirror like you do. Is it style over substance? No. The style is the substance. Don't be fooled by the pronounced slickness and louche trappings. 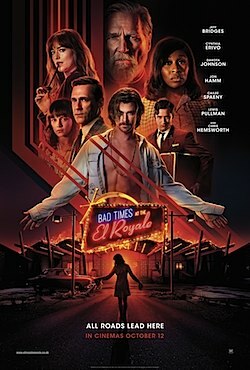 Bad Times At The El Royale is a surgically assembled, note-perfect masterpiece. Pulp Fiction, Identity, Murder On The Orient Express, Drive Angry. It's in the top half of the CV, that's for sure. Level 1: The voice of Captain Cormac out of The Old Republic is in this. • ^^^ That's dry, British humour, and most likely sarcasm or facetiousness. 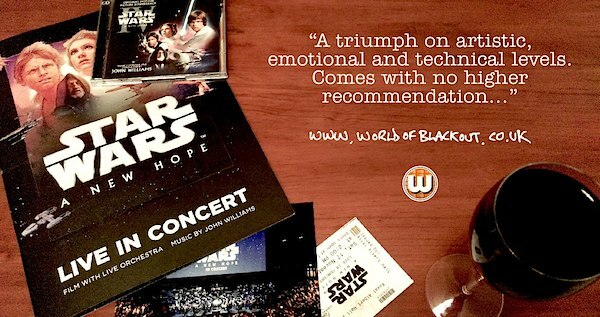 • Yen's blog contains harsh language and even harsher notions of propriety. Reader discretion is advised. • This is a personal blog. The views and opinions expressed here represent my own thoughts (at the time of writing) and not those of the people, institutions or organisations that I may or may not be related with unless stated explicitly. Now I am intrigued to see this one! Didn't you say something about..? I quite like this. E-mail me more of it. Does anyone actually read this rubbish?